Chusquea gigantea syn: (Chusquea breviglumis) is a big bamboo so if you fancy having this giant bamboo in your garden it will need plenty of room. Use as a specimen plant against a plain background such as a wall or fencing for maximum impact to show off the giant structure of this species. 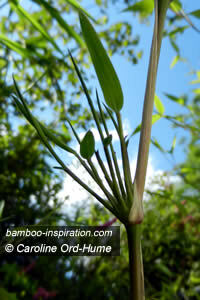 Gigantea originates from the Andes in South America; this is a cold hardy bamboo suitable for colder temperatures. This is a big open clumping bamboo (pachymorph rhizome system) and over a 10 year vigorous growth period the clump may spread up to 4 m (13 ft.) wide. Under optimal conditions it could even spread to that width within half the time, 5-6 years. On average, expect a spread of 2-4m (7-13 ft.) for the width of the clump. At a maximum height this species could reach as high as 16 metres (52 ft.), although 10 metres (32 ft.) would be more common, having said that, it is unlikely to reach those heights unless it's a really happy bamboo. A more likely average height would be 7.5m (25 ft.). An average diameter would be around 3 cm (1.2 inches) with a maximum, in best conditions, reaching a culm width of 6 cm (nearly 2 and half inches). Deep pink to almost a blood shade in colour, the shoots grow upwards really fast and are definitely something you can see a speedy growth rate in on a daily basis! If you like to look at your bamboo every day to see how much it has grown, this is definitely a plant for you. Persistent tightly wrapped sheaths that may stay on the culms for a couple of years. The sheaths of Chusquea gigantea look different to many other species sheaths, they seem quite short and tight against the culm, and they tend to crack or split as the culm grows but don't fall off very readily. 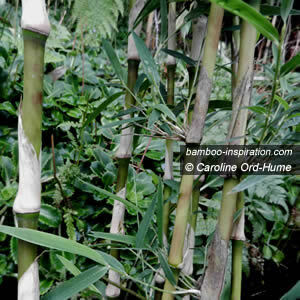 Tall and vertical culms of green maturing to a paler green, or more of an olive green colour. The culms may display other colours depending on the level of exposure to sunlight. Like many bamboos, sunlight can bring out different culm colours to those where the bamboo receives more shade or stands in dappled light. 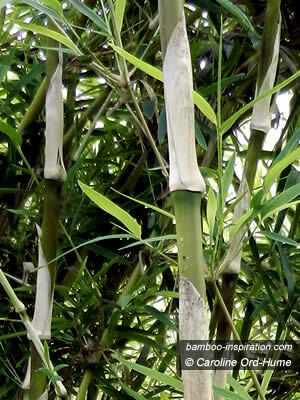 Gigantea bamboo has a characteristic identification branch system. The image shows an emerging group of branches, one dominant branch, and multiple subsidiary branches growing from a culm node. I am quite fascinated by the emergence of new branches from multiple branch buds on the Gigantea nodes. A bunch of branches will emerge with one dominant primary branch that reaches around a metre or more in length, and several subsidiary branches on either side. This branch system goes some way to helping identify the bamboo. Gigantea leaves are quite narrow at around 1 cm (nearly half an inch), but they are also long at 12 cm (5 inches). Right: Culm and node with a group of new branches growing from buds. Hardy to a minimum temperature of -18°C (0°F), zone 6. Gigantea like to be in the sun or light to dappled shade. For example, it would appreciate some sun in the morning for a few hours but may not like full sun in the middle of the day if it's a really hot climate. Leave around 5 metres (16 ft.) space for it to spread as it may take off quite vigorously and surprise you. Being a giant bamboo, Chusquea Gigantea (syn Chusquea breviglumis) does better and has more of an impact in the garden or landscape if planted in an isolated position, perhaps in the middle of a lawn. Gigantea culms retain their sheaths and the overall appearance of the culms and sheaths is improved if against a plain background such as a wall, fence, building, or even the sky. If there is too much vegetation around and behind it you will not get to appreciate the structure of the vertical culms, sheath colours, and beautiful arching branches. Keep this in mind when choosing a location for this specimen plant. The Genus 'Chusquea' is native to the Andes, South America but many of these other species are not cold hardy so check their known hardiness prior to buying. Gigantea is hardy down to -18°C (0°F) but other Chusquea species may not tolerate the cold. Chusquea andina - not as hardy as the others so a lower temperature than 15°C (5°F) would not be suitable.